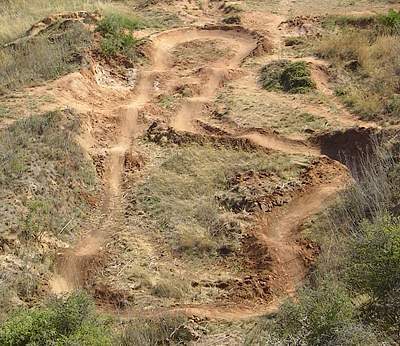 On Saturday the Trail Crew will head out to finish building and then ride the Quail Valley pump track near Gorman. We could use some more help! We will meet at Hans' house in Granada Hills to carpool or if you want to come up later that is ok too. Send an e mail to trailwork@corbamtb.com to let us know you are coming and to get directions. In case you do not know what a pump track is it is a series of rollers and berms that you pump through with out pedaling. It is really fun a a great work out too!